To be honest, we didn't plan of staying very long at the Reebok's event. I just wanted an excuse to bring Cookie out to ECP again for a long walk. But we ended up hanging around for 2 hours! I have to split the blog into 3 in order to have a complete recount of the fun time we had. We arrived just after 4.30 pm and was pleasantly surprised at the offerings in our goodie bags. There's a pink scarf. I put it on Cookie and she's ready to go! We saw a group of Pawer walkers heading towards the lagoon so we followed. But Cookie was easily distracted and it was a long way to catch up with the group. We played cheat. We waited at the junction of the lagoon and food centre for the first group to turn back. Then, we turned back too. It was too hot. We were so happy to find a stall selling popsicles participating in the event (Popaganda). They were giving out a complimentary banana, carrot and flaxseed popsicle to cool down the dog. But human has to purchase for own consumption. The popsicle was initially frozen and too cold to be licked. Cookie didn't eat it. Maybe she knew that licking a frozen thing would result in her tongue being stuck with the ice. When the popsicle started to melt, Cookie finished it up within seconds (below, left), and even finished our strawberry one (below, right)! We then headed to the photo booth, which began to have a queue. When we reached the booth, we got to know that it was for the look-alike photo contest. We didn't think we have any resemblance with Cookie (my eyes are half of the size of hers and my face is not as long as hers) but still went ahead to take the photos for fun. 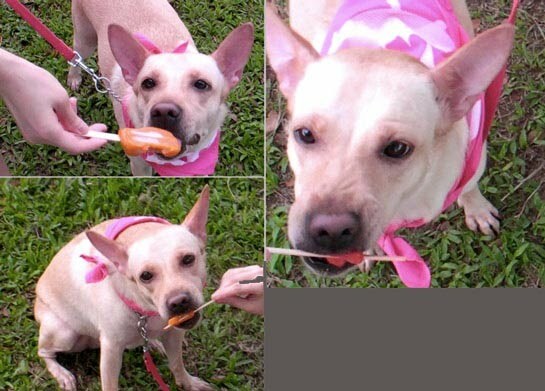 Vincent said Cookie showed her 'pig face' (see 1st and 3rd photo). Next, Cookie got into action participating in the dog race. Stay tune to see how Cookie did in the race.